This artist's concept shows what a fiery hot star and its close-knit planetary companion might look like close up if viewed in visible (left) and infrared light. In visible light, a star shines brightly, overwhelming the little light that is reflected by its planets. 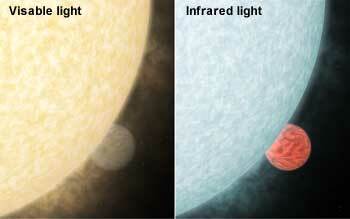 In infrared, a star is less blinding, and its planet perks up with a fiery glow. Image credit: NASA/JPL-Caltech. This graph shows changes in the infrared light output of two star-planet systems located hundreds of light-years away. 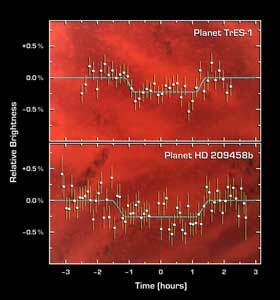 The data were taken while the planets, called HD 209458b and TrES-1, disappeared behind their stars in what is called a "secondary eclipse." The dip seen in the center of each graph represents the time when the planets were eclipsed, and tells astronomers exactly how much light they emit.